Buzz Kill Ramblings of Tim Louie: GENE SIMMONS WHO? The legend that is Gene Simmons from Kiss might be getting put to the test this week as Gerkary Bracho from Ocala, Florida shows off her lengthy licker on YouTube. I guess Florida is not only full of dummies. They have some freaks too! All kidding aside, licking your own elbow is supposed to be one of life's impossibilities, but not for Bracho, who can do it with no problems at all. The Venezuelan native can be seen performing some bizarre tongue-twisting tricks via YouTube and they're tricks that might even make Gene Simmons from Kiss blush. 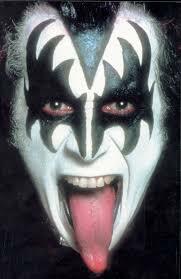 The Demon from Kiss has a legendary tongue that is said to have pleasured many women in his time. I'm sure Bracho's boyfriend is very pleased as well. Wow! In one video she opens her mouth and extends her tongue way below her chin. She then turns to her side and curls her muscle up to lick the tip of her nose. Then she shows that she can pick her nose, stuffing her tongue up both her nostrils. The contortionist then pulls her tongue out as far as it can go with her hand, showing it is as stretchy as it is long. She then touches both ears with the tip of her tongue before extending it so far that she licks her own eye. I'm gagging just thinking about trying it. Bracho must have amazing gag reflexes. And for her finale in the video, she licks her own elbow before sexily winking at the camera. Bracho has not published the exact length of her tongue and she currently does not hold the official record. Gene Simmons doesn't even hold the record. According to Guinness Book of World Record, the longest tongue belongs to 26-year-old Nick Stoeberl from Salinas, California, who's tongue measured in at 3.97 inches from the tip to the middle of the closed top lip. That record was recorded back on November 27, 2012. These photos don't do Bracho's tongue any justice. You have to see her tongue in action through the YouTube video. I'm still in awe! Check it out!